7:30 in the morning and we’re still in bed. On Friday, even! No, I will not get up – I’ve been ordered to stay home from work. It’s my furlough day, a popular non-vacation, non-holiday, non-paid weekday utilized by many businesses during our current recession. Streaming it to this 3-day Memorial Day weekend assuages the grief of a thinner paycheck. 8:30 in the morning and we’re still in bed. Eventually, we shuffle to the couch, but lounge in our “cozies” (that stage of dress between pajamas and you-look-fine-we’re-only-going-to-the-supermarket attire) until 2:30. No furlough for the rain, though. The sky continues pouring it over the curbs like an over-eager busboy refilling your glass after every sip. We remain indoors. Well, except for a quick jaunt to New Seasons for a chocolate-covered old fashioned. As a cold marble of rain plinkos between my shoulder blades, I remember I could be hunched over my keyboard at the office, futilely engaging a non-responsive FTP site. For that, I could even shrug off fists of hail. Back home, Erin and I wordlessly communicate with our online compatriots. We Facebook (a new verb), Twitter (an old verb, but used in a new way), Wave (see “Twitter”), IM, email, blog, slog, farkle, gazinta… and before you know it, we’re both speaking Yiddish. Note: the protagonist of my debut novel will be named “Farkle Gazinta”. But did we waste the day, with all the social networking? Some will say “Yea!” exuberantly. Others, “no”, with nary a glance askance from their Blackberry. Or Droid. 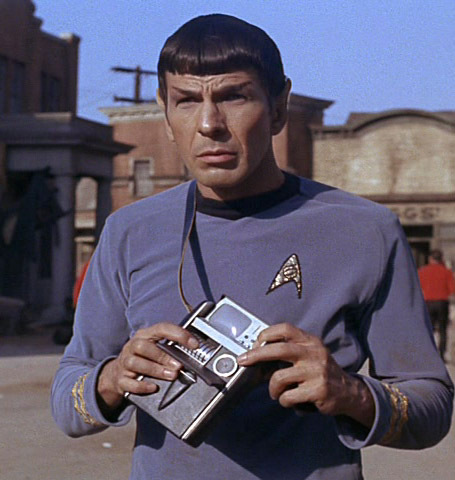 Or Tricorder. It’s as if all my Star Trek toys from 1975 were fully operational. Just like you need a good 8 or so hours of sleep to recharge your body’s battery, you need an occasional 3 to 4 day weekend of laziness to recharge your spirit. I subscribe to Ferris Bueller’s dictum of “Leisure Rules”. As usual, my ITSK deadline hovered like a swarm of obscenicons in the lowery sky. How fortuitous it fell on my day off! If only my particular “writer’s combination” would unlock my creative side in time! I require a precise trifecta of Inspiration, Articulation and Discipline before I even consider tapping the keys. Of the three, Discipline eludes me most often. Sometimes I write the entire article in my head before I get out of bed in the morning but can’t push myself to the physical third of the job. Ah, you guys are probably hungry by now. Erin depends on her own trifecta for her recipes, I suppose, but she seems to struggle less with her decisions. Like the other night when we hosted a surprise party for a member of her pre-legendary, semi-fictional band Trifecta. We were expecting seven guests in 2 hours and Erin hadn’t decided what to make for dinner! I left the room to powder my nose and when I returned, Boom! Inspiration had struck! Followed quickly by what I filtered as Articulation and the oh-so-elusive Discipline! We were back from the supermarket in 30 minutes, pre-heating the oven and thawing the frozen spinach. I don’t recall the party that well, but Erin’s stuffed chicken lingers in my sense memory like a great novel. Erin’s Intro: I had about 10 minutes to decide what to cook for a large group of people and NO clue what I was going to make. Panic was setting in. Usually I don’t plan what I’m going to do anyways, but this was a whole new level of procrastinating. (An HNL, if you’re in Trifecta). So I’ve got 5 cookbooks out and I’m flipping frantically through trying to find something that will be nice enough for a dinner party, but easy enough to pull together with limited time. And then, Voila! I found this stuffing recipe. It’s pretty brilliant. I used chicken breasts on the bone, but in the future I’ll most likely do it another way, so I’ll explain both. ½ package frozen spinach, thawed. Option 1: Using a meat tenderizer, hammer out the chicken breasts until they are about ½ inch thick. Divide the cheese mixture into four even amounts. Put ¼ of the cheese mixture onto half of each flattened chicken breast. Fold the other half over the mixture to close it. Place the chicken packages in a greased baking dish. Brush the breasts with melted butter and season with salt and pepper. Bake at 375 degrees for about 45 minutes, or until chicken is cooked through. Option 2: Use chicken half breasts on the bone and stuff the mixture under the layer of skin. Brush with butter and season with salt and pepper. Bake at 400 degrees for 30-45 minutes, until chicken is cooked through. Quick! What’s your fave ITSK recipe? I know – how can you choose just one? Mine? Whatever one I’m currently eating (at the moment, a swell whole wheat pasta dish with honkin’ sautéed mushrooms). Adam and Josh (who else?) have joined us for tonight’s celebratory meal. Adam asks what we’re listening to. It’s Leon and Mary Russell’s “Wedding Album.” I’d thrown it on the turntable on a whim. Jackpot, I thought to myself. The first album by newly married Leon & Mary Russell served as fitting accompaniment to our long-running stage piece “In the Sellwood Kitchen.” This is our 35th performance. The bulk of each article is merely the preface to the recipe. Conveniently, in The BEE, Erin’s introduction and her recipe can be found in a shaded box at the end of the article. The hungrier reader can scan ahead to this point and disregard the appetizer of the article (unless of course the recipe is an appetizer). I understand scatological humor is not everyone’s cup of tea, but it’s my teapot! Do you have any idea many much overtime my internal censor logs each month as I compose these articles? Time and a half, he gets! It’s costing me a spiritual [expletive deleted] arm and a leg! I’m considering going back to pre-Comics Code Authority days. Nobody knows your friends, Josh would say. He and Adam are a big reason I have hard time coming up with these family-friendly episodes! Often I’ll start writing the article “live” in the living room whilst the shenanigans progress in the kitchen. Curls of colorful language pass the kitchen’s threshold. Anna Wintour, editor of Vogue said (in this documentary I’m watching as I type), “Fashion’s not about looking back, it’s about looking forward.” I feel the same way about the Kitchen. One thing won’t change: good food done good. Scratch that (though it flows better): Great food done better! Like these fish tacos Erin’s prepared for us this evening! These will be Josh’s first fish tacos. Erin’s Intro: It is time to bust out the BBQ! And thank goodness, too! For our super special 3 YEAR anniversary episode, we did something fancy. And by “fancy” I mean – not chicken. I don’t have a lot of experience making fish, and I’ve only made tilapia for the Sellwood Kitchen. Of course you could use tilapia for this recipe, but we needed to change it up. Plus, cod was on sale. The fish recipe is simple but tasty. The coleslaw is something my mom always makes, I don’t know where the recipe came from, but it’s super fresh and delicious by itself. Add it to the taco and it’s a pretty delicious combination. This was a fun recipe to ring in spring with, and to celebrate three years of great friends and great food. Cut fish into approximately 3 to 4 inch pieces. Season with salt and pepper, lightly sprinkle with chili powder, and drizzle with fresh lime juice. Let fish rest in refrigerator for 30 minutes. Make tin foil packages for each piece of fish. Top with small piece of butter and close package. Place packages on BBQ for about 10 minutes or until fish is cooked through. Remove from packages and break fish into chunks with a fork to serve. ½ head of green cabbage, sliced into thin strips. Whisk together lemon zest, lemon juice, mayonnaise, sour cream, sugar, salt and celery seed. Toss with carrots and cabbage. Chill for ½ hour before serving. We topped ours with fresh cilantro from the Sellwood Kitchen herb garden.